The skier guide for all the resorts in Romania. Poiana Brasov, Sinaia and Predeal ski resorts are presented with ski facilities, snow reports and the list of hotels and villas with reservation option. Online guide covering North American ski and snowboard resorts. Includes news, snow reports, deals, lodging, event reports, and resort information. Provides reviews, snow cams and reports, and links to ski and snowboard resorts in Australia and New Zealand including associated services. Also includes ski tips from Tommy Tomasi and ski related links. Information and statistics provided by Vermont Ski Resorts. Provides lodging, snow condition, and general information for Utahs ski resorts. Information and surveys about ski resorts and gear, snow reports, ski technique, news, health, and fitness. Ski reports on snow conditions at all Vermont ski resorts Monday through Saturday. Snow reports for over 180 resorts worldwide, plus a searchable archive of historical data, and online Ski Shops. Snow report, lift tickets, maps, lodging. Links to other ski resorts in the Rocky Mountains. Offers customized skiing holidays and snowboarding vacation packages to mountain ski resorts throughout the Western U.S. and Canada. Information and links to thirty-plus resorts, snow conditions, lodging options and regional events. Provides complimentary vacation planner. Snow updates, road conditions and weather reports for Southern California resorts. Includes online guide to Big Bear. Provides links to snow and weather reports, snowcams, and resorts with a focus on European countries. Also offers monthly newsletter. Information about California and Lake Tahoe resorts, including statistics about trails, lifts, elevations, and annual inches of snow. Snow conditions, lodging and restaurant guide for North American resorts. Also offers information about the Extreme Team videos and clinics. Contains Jake Moes Snow Report, Larry Schicks Powder Watch, information about resorts, calendar of events, and weather and road reports. Links to ski resorts, snow conditions, road conditions and ski instructors. Snow conditions, mountain resort information and special events at ski resorts. Details on ski packages, snow conditions, and press releases for all Lake Tahoe ski resorts. Information on ski resorts in the Dolomites. Directions, areas, activities, accommodation, ski schools, ski hire, ski insurance, news, weather and snow reports. Includes web-cam. Complete ski vacations with emphasis on European resorts. Also offers North American options. Packages include air, lodging, lifts and other tour features. View information on all of the ski resorts in Colorado. Includes snow reports, resort details, and a photo gallery. Guide to ski resorts, lodging, snow conditions, shops, discounts, and events in the Lake Tahoe region. If the business hours of OnTheSnow.com in may vary on holidays like Valentine’s Day, Washington’s Birthday, St. Patrick’s Day, Easter, Easter eve and Mother’s day. We display standard opening hours and price ranges in our profile site. We recommend to check out onthesnow.com for further information. 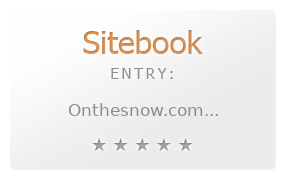 You can also search for Alternatives for onthesnow.com on our Review Site Sitebook.org All trademarks are the property of their respective owners. If we should delete this entry, please send us a short E-Mail.